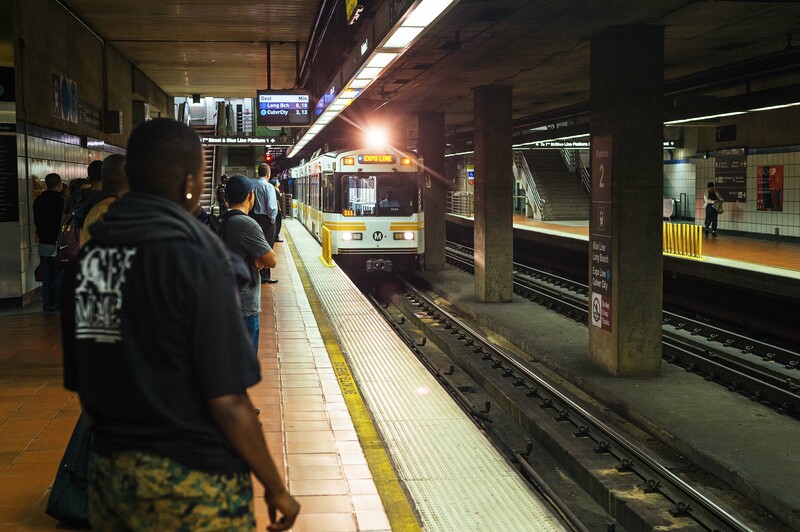 ART OF TRANSIT: An Expo Line train at 7th/Metro Station last week. Photo by Steve Hymon/Metro. The city of Los Angeles is moving along the purchase of a 41-acre piece of property that sits between Rio de Los Angeles State Park and the Los Angeles River, reports Joe Linton. The site of former railroad yards, the property has been in limbo for years and has some soil contamination issues. Still, it’s a key acquisition as the federal Army Corps of Engineers likely would not do river restoration work on privately-owned land. This really helpful post includes aerial views, maps and renderings. This is really great news — this is a big chunk of land along the river and it’s great to see the city moving forward on acquiring such parcels. Although this isn’t directly a transit-related story, I can also imagine a future for the area — perhaps a couple decades off — with a partially restored river between downtown L.A. and Glendale lined with parks and perhaps some new residential units. The area could be connected to DTLA via bike paths, Metrolink (Glendale Station) and the Gold Line’s existing Chinatown and Lincoln/Cypress stations. Actually, the headline is a little inaccurate: the family members of Board Members get free travel for life, too! The Board is going to consider ending that perk at its meeting Thursday. Some say it’s a little over the top, others say it gives them the chance to ride the system and see how it’s performing. In an effort to steer around Congressional approval of a treaty — which has proven nearly impossible — President Obama is trying to forge an “agreement” between nations to lower their greenhouse gas emissions. It’s uncertain how much an agreement would be legally binding and how much would be voluntary. In the U.S., the transportation sector is responsible for about 28 percent of greenhouse gas emissions responsible for global warming. As we’ve noted before walking, biking and taking transit instead of driving alone are good ways to lower your carbon footprint. The best part: he did it to raise awareness of the need for better bike infrastructure and to promote cycling. And he did it in a suit. The old aluminum benches won’t be returning says the bus agency — as they encourage loitering. The new bus stops that Big Blue Bus has been rolling out in Santa Monica have inspired some complaints. The agency says they’ll be refining the design. America has been sliced and diced by roads and development and the grizzly bear that graces California’s state flag is pretty much relegated to the areas around Yellowstone and Glacier national parks. A small population is also still present in the northern Cascade Mountains of Washington State and the federal government is beginning a process of deciding whether to boost populations by possibly transplanting bears from elsewhere. Earlier this year, the group The Center for Biological Diversity filed a petition asking the feds to consider that viable bear habitat remains throughout the West, including California. I can’t imagine grizzlies ever being reintroduced to populous California — grizzlies are far more aggressive than the black bears living here now. Nonetheless, this is an interesting story raising questions. As our urban areas continue to grow in the Western U.S., the question remains how much room will there be for native wildlife in the sections of the West that are owned by the federal government (National Park Service, U.S. Forest Service, Bureau of Land Management, state parks). I doubt the folks who regularly comment on this blog could care less, but I suspect there’s a much larger readership here that likes to mull the big picture. Steve, I guess your vacation expanded your views beyond buses. Grizzly bears are a protected species. Introducing them to new habitat may harm them and may be a dangerous endeavor. The danger from black bears so close to populated areas already exists and many people camp out on the week-ends not far from us in the mountains. As we have recently seen a mountain lion has traveled from the Santa Monica Mountain National Park to the Hollywood Hills. What’s to stop a Grizzly Bear from continuing it’s journey into a more populated area. While visiting Montana I was told about a terrible incident there at my brothers grandchildren’s school. A bear came down from the mountains and killed a small child in the school yard. This school is on a major highway and there are several homes and farms along the road leading up to the mountain behind it. It’s rural but not that rural. I always had views beyond buses. A quick internet search showed no media stories about a bear attack in a school yard in Montana. If memory serves, there was a mountain lion attack in a school yard in British Columbia in the 1990s. Steve, what happened came from the mouths of my brother, his wife and the rest of the extended family that all live nearby. I don’t know why you could not find it on the internet but judging from the other wildlife I’ve seen up close just on their property it seems very plausable. I’ll do a search and keep you and others informed. The board members already have the chance to ride the system, just like everyone else, but it probably would be even less financially burdensome for them to do so than for the public at large. That doesn’t seem like a good enough reason to be letting some guy’s son get free rides twenty years after dad’s retired. Most telling, of course, is that the board members have to be incentivized to check out the performance of that pesky thing they’re supposed to be caretaking. Not that BART seems to be a problem system: whenever I’ve ridden it, it’s always gotten me where I needed to be, right on schedule. The “Art of Transit” caption is just a test to see if we’re awake, right? Steve, more interest than you probably realize! however, I have to point out that the bear on the California flag is the California Grizzly/Brown Bear, which went extinct in the 1920s. other Grizzlies are related to this bear, but not the same, so unfortunately the bear on the state flag can’t be reintroduced without some Jurrasic park-style bioengineering! “Populous” California depends where you’re looking. Living here in the southland may look like all of California is this concrete jungle in the middle of an arid water deprived area but for the most part, California is a wilderness of various climates. If anything, 1 in 4 Californians, or 10 million people live right here in this small metropolitan county, while the other 3/4 of the population are spread out in the third largest state in the nation. There are plenty of wildlife in these areas. If bear came into their area and threatened people in those areas, they have one simple rule: bring out the shotgun. The chances of a grizzly bear even if introduced to California, making its way to densely populated centers like San Francisco and Los Angeles is highly unlikely to happen. Geographical boundaries and climates are unlikely to be fit for a grizzly bear to wander out of their natural habitat, much as the unlikelyhood of the small grizzly bear population in the Cascades making its way to Seattle. The natural habitat of the Grizzly is the Los Angeles basin. They covered the area before people came. They are not mountain bears like Black Bears. The California Grizzly that once roamed the LA Basin is extinct since the last sighting in 1924 and is different from the Grizzly species that are on the endangered species list that they are planning to reintroduce into CA. The natural habitat of the endangered Grizzlies are mountainous. Any Grizzly Bear introduced back into CA isn’t likely going to be plucked down anywhere near Southern California or anywhere near densely populated areas which aren’t their natural habitat. The likelihood of a Grizzly Bear walking down Market St. or Wilshire Blvd. isn’t going to happen, much as the other Grizzlies in the Pacific Northwest isn’t going to head out to Downtown Seattle. Even if the minuscule amount that it might, that’s why we pay taxes to have Animal Control officers. Stop using the word “free.” There’s no such thing as “free” in this world because in the end, someone ends up paying for it. If Metro employees and their dependents are getting rides gratis, then it’s the taxpayers that are footing the bill. Metro employees and their board members should pay for the rides just like everyone else so they know how much fare increases will affect them too! They’ll never understand the concerns of the public if fare increases don’t affect them because no matter how much they increase it to, it’s “free” for them, but taxpayers have to pony up their bill!